Set your Monster apart with this tough looking Rally Stripe Graphics kit. Easy-to-install kit is packaged as a set of two (2) PRECUT pieces, ready to install, in a wide variety of colors - NO TRIMMING required. Stripe package is not just a set of 2.75" (6.99cm) strips in a box. Kit consists of prefitted, tapered and contoured pieces that feature a .098" (2.48mm) pinstripe at each side as shown. 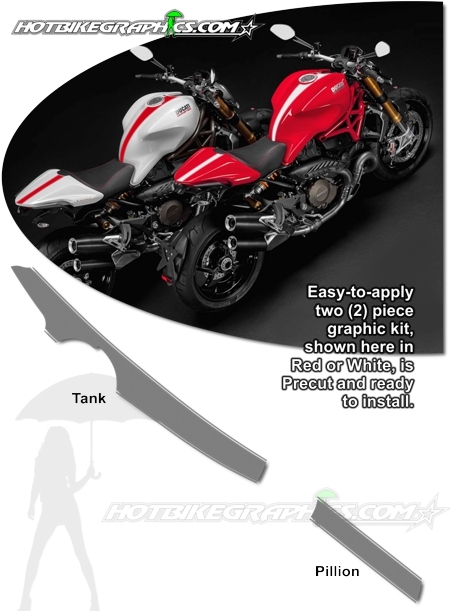 Rally Stripes are specifically fit for the '14-Current Ducati Monster Tank and Rear Seat Cowl areas of the Monster model shown. It will not fit any other bike. An additional 10" (25.40cm) long piece is included that may be used for Front Fender or Windscreen areas as desired.